Edward1 Riggs the Immigrant passes his Y chromosome, and hence his YDNA, to all male descendants in unbroken chains of male descent - follow the yellow (for Y chromosome). This is true for all males. So all his male descendants with surname Riggs share his YDNA. Exceptions are male descendants who are not biological descendants - by adoption, say. No female descendants receive Edward's YDNA. There are no yellow descendants of Mary2 Riggs (or of Mary3 Riggs). * The superscript number is the generation number. 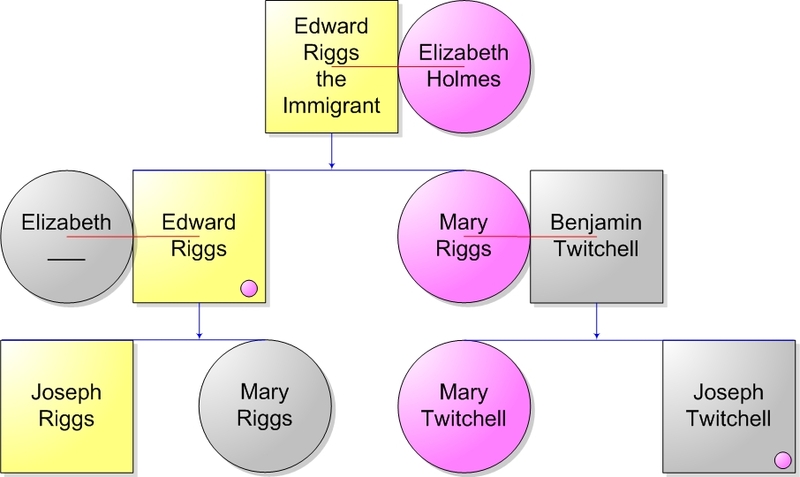 Similarly, Mary2 Riggs passes her mother Elizabeth's mtDNA to all her children. That's why Joseph Twitchell has the magenta dot, but none of his children will have that grandmother's (hence his mother's) mtDNA. There are no magenta (or yellow) descendants of Joseph3 Twitchell. * So mtDNA is passed in unbroken chains of female descent (with possibly one male tacked on the end of the chain). The exception is female or male descendants who are not biological - by adoption (adultery doesn't matter in this case). There is no surname clue to mtDNA descent as there is for YDNA. YDNA tests of Edward the Immigrant, Edward, and Joseph would show them to have a match in their Y-chromosome DNA, but that match would not show which generation they were in. You would not be able to tell from a match who was father or brother to whom, only that they were indeed related malewise to a common male ancestor. mtDNA tests of Elizabeth Holmes, Edward2 Riggs, Mary Riggs, Joseph Twitchell, and Mary Twitchell would show them to have a mitochondrial match (their mtDNA would match), and hence that they were indeed related, but that match would not show which generation they were in. 1. A male passes his Y chromosome (hence his YDNA) to his sons unchanged. The sons pass it on. So YDNA follows pure male lines. 2. A female passes her mitochondria (hence her mtDNA) to all her children, but only the daughters can pass it on. So mtDNA follows pure female lines, except there can be a male at the end of the line. 3. I haven't mentioned it above, but there is the small possibility of a mutation being introduced to either the YDNA or the mtDNA at each generation. These turn out to be useful in our study. * Blanket statements like this assume no marriages between cousins. Notice that if Joseph Riggs were to marry Mary Twitchell (he didn't), and they had a son and a daughter, then two of the statements above with asterisks would be false. The daughter would carry the magenta DNA, and the son would carry both the yellow and the magenta DNA. What is a YDNA signature? You might want to browse my entire site. Or my genealogy site. Or just the special Edwardian Riggs site.